Another year has passed without reaching my dream of a 10lb bass, in fact I didn't feel I was even getting close. But looking back its been my best year for numbers and in particular, the high numbers of bass between 5-6lb. It all started at the beginning of the year when I finally got into lure fishing, and kept it going throughout the summer as I was having success. I know! The largest on lure was around 3lb with plenty below that size. Most were harbour fish caught on a particular stretch and state of the tide and great fun at night during the hot summer we had. I do wonder if I should have continued with the method through to early winter but a succession of large bass to 8.5lb (largest caught by my brother in law) meant I dropped the lures for squid and mackerel and concentrated on the shore. I do recall one daylight session when I had a lure fisherman to my left and another bait fisherman to my right and I was the only one to catch while I was there, so I did feel slightly justified with the switch-over to bait. Tactics haven't changed a great deal since last year, although I have dispensed with the weak lead trace and now use 30lb+ line as I've found its a lot less likely to tangle in the wash zone. I have also used squid in the later part of the year a lot more with great results from the 5lb+ bass. It also has the added advantage that smaller bass are less likely to run with squid with the hook outside of their mouths as they are inclined to do with half a mackerel. Its also been great to catch three December bass this year up to 5 3/4lb - does make you wonder if they have always been around? Looking forward to this year once again and hope the fishing will continue into January and February. There is one mark I didn't concentrate on nearly enough, especially when looking back at my results as all the biggest bass came from there, so I need to make amends, although previous years the fishing can really switch off on that stretch of coast. I'm also going to continue with the lures this summer and may have found a new spot to try as well which I'm hoping will be very interesting. 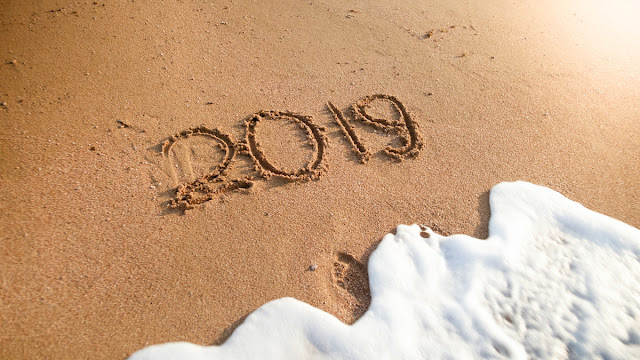 Thank you to my two readers who continue to pop-in, I hope you have a great 2019 and your rod's bend to the fish of your dreams.